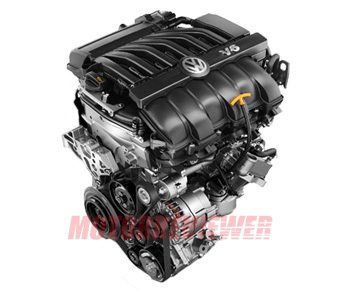 The VW 3.6 FSI engine is a VR6 (narrow V family EA390) gasoline 3.6-liter engine. It was first introduced to Audi Q7 in 2005 (BHK and BHL engines) and later to other VW vehicles: Passat R36 and CC (BLV, BWS), Phaeton (CHNA and CMVA), Touareg (CGRA and etc.). The 3.6-liter version was build from the 3.2 V6 FSI engine installed in Audi models. The bigger displacement gave a noticeable increase in power and torque compared with the 3.2L engine. The 3.6 FSI engine has a new 10.6 degrees VR-shape cylinder block made of cast iron with lamellar graphite. The cylinder offset was also changed from 12.5 mm to 22 mm. The dimension of the new cylinder block is the same as the 3.2 VR6 manifold injection engine. The oil pump is integrated into the engine block. Now, the engine has cast iron crankshaft but still carried by seven main bearings. There are also new aluminum alloy pistons with a graphite coating. The 3.6 VR6 engine has 24-valve cylinder head made of a hypereutectic 'Alusil' aluminum-silicon alloy (AlSi17Cu4Mg). The cylinder head design is identical to the 3.2 FSI V6 engine head. The engine has double overhead chain-driven camshafts. One camshaft is for all intake valves, and one for all exhaust valves. Both of them are equipped with continuous timing adjustment. The variable valve timing system has a following maximum adjustment of the camshafts: 52 degrees for the intake timing; 42 degrees for the exhaust. The cylinder head has 4 valves per cylinder (24 valves total). They have an unequal length. The diameter of the intake valves is 33.2 mm; the diameter of the exhaust valves is 30.2 mm; the valve stem diameter of both valves is 6 mm. The valves are actuated by low-friction roller finger cam followers equipped with hydraulic valve clearance compensation. The engine has a direct fuel injection FSI (Fuel Stratified Injection). The fuel injectors are mounted from the intake sides. The bores for cylinders 1, 3 and 5 are located above the intake manifold; the fuel injectors for cylinders 2, 4 and 6 are installed below the intake manifold. The high-pressure fuel pump is located on the cylinder head and driven by the camshaft timing chain. It produces fuel the pressure of 1,595 psi (110 bars). The 3.6 FSI has a plastic variable length intake manifold with the power and torque positions switched by opening and closing the flap control valve. The power settings are actuated at 0-1,200 and 4,000+ rpm; the torque position is switched on between 1,200 and 4,000 rpm. The engine also has an electronically controlled throttle valve/body (drive by wire). The engine is controlled by ECU Bosch Motronic MED 9.1. The ignition is also electronic. The exhaust system is equipped with two pre-catalytic converters and two main catalytic converters. With all these features, the 3.6 FSI engine complies with the Low Emission Vehicle (LEV2) and European Euro 5 emission standards. The Volkswagen 3.6l VR6 FSI engine is very reliable and durable engine and it easily reaches 250,000 miles (400,000 km) mileage and more. It is required high-quality fuel and oil with regular oil change and proper maintenance. There are not many common problems found in consumer’s reports about this engine. We can only single out some problems with ignition coils in first years of production. Also, the engines with big mileage can have oil leaks from crankshaft oil seals. CDVA - 191 kW (260 hp) at 6,000 rpm, 258 ft lb (330Nm) at 2,500-5,000 rpm. This version has low compression ratio 11.4:1. Application: Skoda Superb 4x4 DSG. BLV - 206 kW (280 hp) at 6,200 rpm, 266 ft lb (360Nm) at 2,750 rpm. The engine is for North America and Middle-East only. Application: VW Passat B6 3.6 FSI, VW Passat B6 R36. BWS - 221 kW (300 hp) at 6,600 rpm, 295 ft lb (400Nm) at 2,400-5,300 rpm. This is a VW Passat engine.